SMΩRF™ is the most powerful and accurate, in-line RF Vector Signal Meter to date with accuracy rivaling professional instruments. Has tons of features, and very high level of user customization to fit every hamshack, every operator's needs. "Particle accelerators work with high levels of RF power. 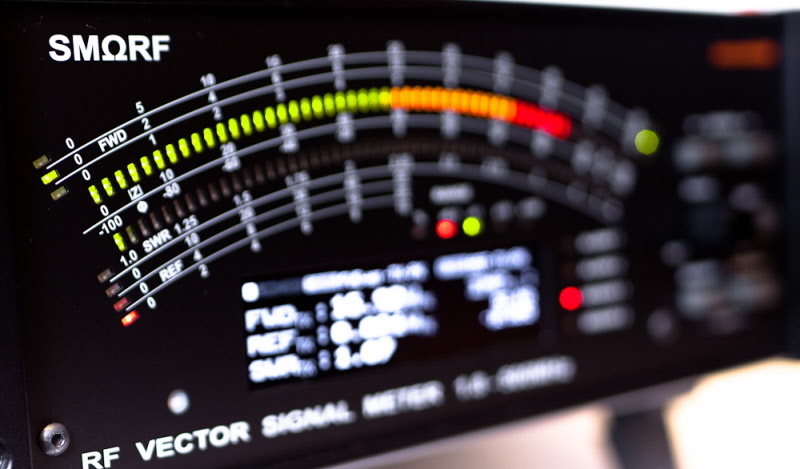 While in accelerators the power is confined in a tight space, the underlying principles are the same as when RF power is radiated through open-air antennas. The power amplifiers, interconnecting cabling and the internal antennas have to be constantly monitored for both safety and operational reasons. For this task on amplifiers for superconducting acceleration cavity, which forms part of the accelerator chain at CERN, we have selected the SMORF power meter from microHAM. It meets our requirements for processing speed, power and SWR ha ndling range and accuracy. The LED bargraph provides an instantaneous indication of power and SWR for the operating personnel, while the Ethernet connectivity enables remote monitoring and measurement automation. And all this comes with a price tag significantly lower than the general purpose measurement equipment which would be used for this purpose otherwise. As ohmic losses in superconducting acceleration cavities are near zero, if the cavity is not loaded by particle beam, most of the delivered power is reflected back from the cavity (subsequently separated by circulator and dissipated in dummy load). That's why a SWR value around 50 - an extreme value for radio amateurs - is perfectly normal in this unusual environment, and the value displayed on this picture is actually an accurate measurement in that particular setup." SMΩRF™ connects to the power RF signal by remote sensor, available in several models for power levels up to 12KW and frequencies from 1.8MHz up to 500MHz. 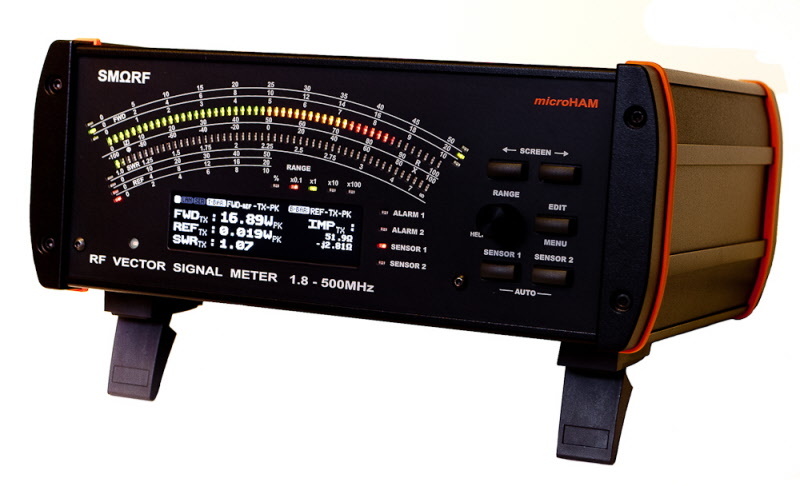 The SMΩRF™ can simultaneously measure two independent signals from any two sensors and shows measurement results on its front panel or computer. 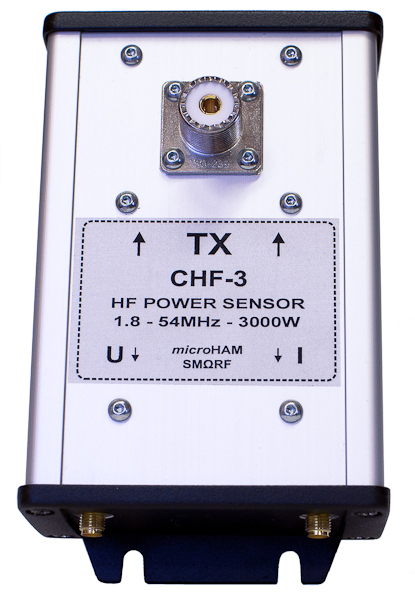 HF + 6m sensors are provided in three models for 3kW, 6kW (1.8-54MHz) and 12kW (1.8-30MHz) maximal peak power. 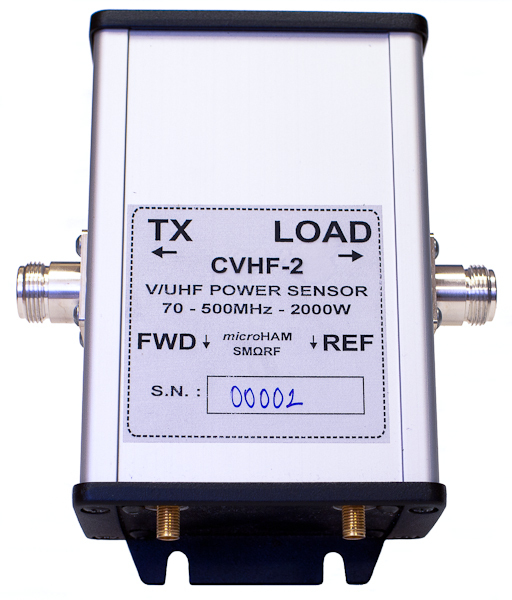 VHF/UHF sensors (70-500MHz) are provided in two models for 2KW and 6KW maximal peak power. Vector measurements (signed complex impedance measurement) are provided with all sensors. SMΩRF™ is not only desktop instrument but Internet enabled device too. Using native IEEE 802.3 Ethernet port provides all measurement results directly to your remote computer, tablet or phone over LAN or the Internet. Does not require local computer. For remote connectivity provides free, open TCP protocol based, high speed Remote Control application for the Windows and macOS, as well as internal HTTP and VNC server for maintenance access from the web browser and VNC viewer (Windows, macOS, iOS, Linux, Android). Every SMΩRF™ base unit, every Sensor, and every Sensor Cable connecting the sensor is individually calibrated on regularly calibrated laboratory instruments (ISO/IEC17025, NIST traceable) using specialized, temperature and computer controlled setup in our lab. 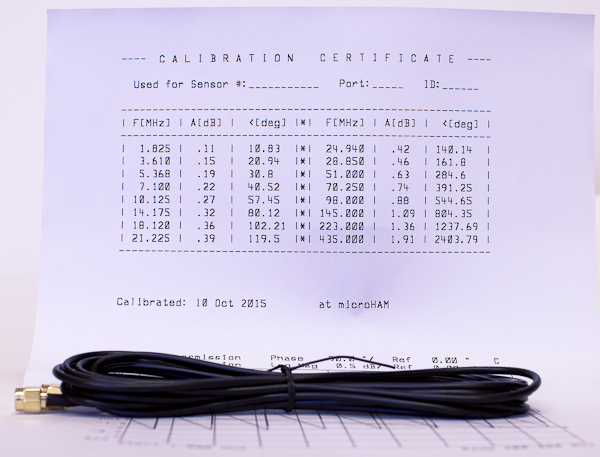 The SMΩRF™ and the Sensor keep calibration data in their memory and every Sensor Cable is provided with the unique Calibration Certificate containing calibration table. SMΩRF™ measures frequency and automatically applies all these calibration data in real-time to provide measurements with ultimate accuracy. Changing or adding new Sensor does not require any factory or user recalibration. In addition, the SMΩRF™ provides simple, built-in calibration process for custom sensor cables if supplied cables are not long enough for user's application, without any requirement for external metering equipment. You are always at the best accuracy. RF Vector Power Meter for measuring all kinds of Power, SWR, Impedance, Phase and Transmission Lines with built-in audio signal generator, oscilloscope and Internet connectivity. Available in four display colors. Optional 3KW HF + 6m sensor for the SMΩRF meter. Optional 6KW HF + 6m sensor for the SMΩRF meter. Please note, 7/16 DIN connectors on sensor are used for a reason, there does not exist SO-239 (UHF) or N connector specified for this power level. If you need connect to another connector type, use 7/16 DIN Adapter cable. Optional 12KW HF + 6m sensor for the SMΩRF meter. Optional 2KW VHF/UHF sensor for the SMΩRF meter. 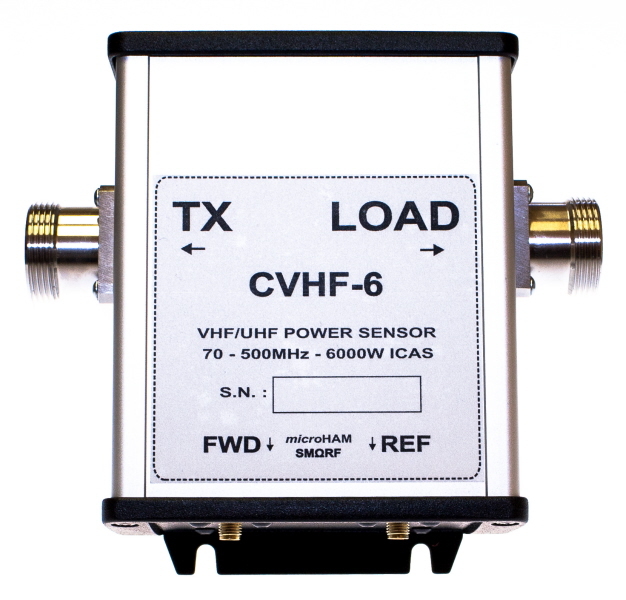 Optional 6KW VHF/UHF sensor for the SMΩRF meter. Optional, RG-174, 2x SMA-M/M terminated Sensor cables. Optional, RG-58, 2x SMA-M/M terminated Sensor cables.